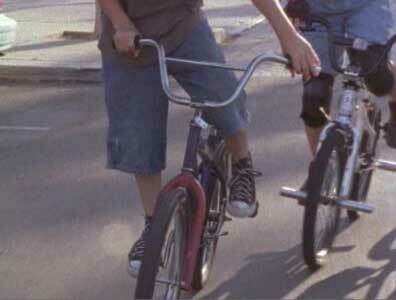 Graham Spillman and Thomas Garner wear black and navy blue high top Converse “Chuck Taylor” All Stars in the film. Ryan, Carlos, Kyle and Lisa become The Bike Squad. Ryan (Bryan Parkes) is a twelve-year-old kid with two divorced parents who live in different towns. Ryan is looking foward to spending the summer with his dad, Ned (Thomas Garner), who is a professor of astronomy in a small college town because he lives with his mom during the school year and she has lots of rules. Although Ryan and his dad have plans for the summer, like an extended camping trip, things change when a professor at the college suddenly retires. Ned is offerred a promotion but on the condition that he must immediately take over all of the retiring professor’s classes. Ned tries to smooth things over by showing him the new bike that he has just gotten him, but Ryan is offended by this because he was expecting to spend a lot of time with his dad and considers the bike to be a “buy off”. That evening Ryan is introduced to Kyle (Graham Spillman) another kid his age, and Kyle’s mom Gail (Stephanie Griffin) who is Ned’s current girl friend. (Kyle’s parents are also divorced.) 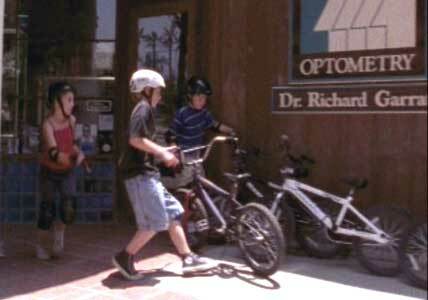 Kyle likes to hang out with a group of kids called The Bike Squad, comprised of two others, Lisa (Callie Waterman) and Carlos (Wolf Bradley). Initially Kyle and Ryan don’t hit it off, and things are further strained when Gail asks Kyle to take Ryan on a bike ride the next day. Determined to show Ryan up, Kyle leads the club on a difficult course through hilly terrain. Although Ryan is able to keep up most of the time, they get separated at one point. Kyle is determined to go on, so when Ryan finally arrives at the trail meeting point, no one is there. Not knowing what else to do, Ryan returns home to play with his dog Jupiter. 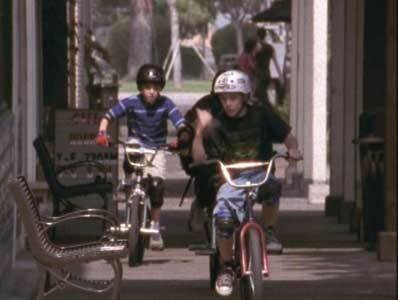 Feeling left out by the other kids, Ryan decides to do things on his own, and goes out to ride his bike the next day by himself, avoiding the other kids when he sees them in town. Unfortunately, when he comes home, Jupiter is missing. Ryan and his dad go looking for him all over town, but he is nowhere to be seen, having been grabbed by two bumbling dog poachers (Michael Vaccaro and Michael Olifiers) who collect dogs for an unscrupulous researcher named Mr. Jackson (Michael McConnohie). The Bike Squad rides through the downtown area in their search for Jupiter. The following day, Ryan wants his dad to go looking for Jupiter again, but he has to teach his seminar at the college. Just as Ryan is despairing as to what to do, the members of The Bike Squad come riding up offering to help. Although at first Ryan doesn’t want their help, after they appologize for the treatment they gave him the other day and explain to him how much more useful four people are than one, he accepts their help. Lisa is good with computers, and quickly makes up a lost dog poster that they begin bringing around town. While passing around their posters, The Bike Squad learns from the local pet store owner about the dognappers who have been snatching dogs around town. Determined to find the dognappers and Jupiter, the kids put an ad in the local paper announcing the finding of a lost dog. When the dognappers show up to claim the animal, they follow them around town, trying to find out where they take the dogs. Eventually the kids are able to track the dognappers to Mr. Jackson’s laboratory. When the kids confront Mr. Jackson about their suspicions regarding Jupiter, he refuses to let The Bike Squad look at the dogs in the back. They even enlist the help of Ned, but when Mr. Jackson denies any responsibility for the disappearance of Jupiter, Ned backs off and tells Ryan there is nothing more he can do. Because no adults believe them or will help them, the kids decide to break into the lab and rescue Jupiter on their own. They are capable of figuring out the security code and breaking in, but inside they trip another alarm, and are not able to find Jupiter. Mr. Jackson and his helpers catch them and are going to call in the police, but it turns out that Kyle’s father (Michael Keena) works at the lab as a janitor, and is able to get the kids off with a warning. Even though they are grounded and in trouble, and no adults believe their claim that Jupiter is a victim of foul play, Ryan is still deermined to look for Jupiter. The balance of the story is how Ryan enlists the help of The Bike Squad one more time to try and find out where Jupiter has been taken and get him back. 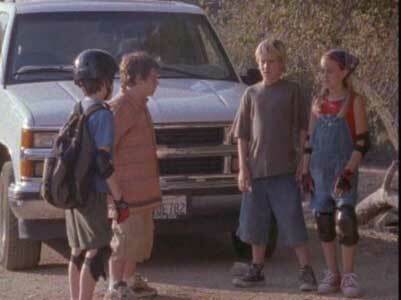 When no adult will help Ryan try and recover his missing dog, the Bike Squad decides to act on their own. The story line for The Bike Squad is pretty thin, and at the end the actions of the adult villains don’t make any sense, but as in any good kids movie, they get what is coming to them. After all you can’t mess with determined twelve-year-olds and their pet dogs. And parents beware: do you know what your twelve year old is doing? Better spend some more time with them before it’s too late! The Bike Squad is a pleasant diversion and a family-style entertainment suitable for younger kids. Two chucks for the film and additional 1/2 chuck for the great chucks camera work throughout the film. Ryan’s father Ned awaits his arrival for the summer. Led by Kyle, the Bike Squad takes off. Graham Spillman, in his role as Kyle, wears black high top chucks without socks throughout the film. Black high top chucks are a good fit for him, because Kyle’s character has a lot of attitude. You also see Ryan’s dad, Ned, wearing navy blue high tops at the beginning of the film. The camera work in this film is very chucks friendly, and you see them in most of the scenes. 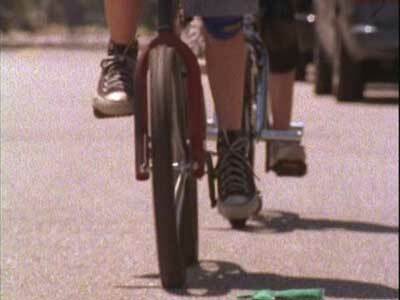 The best chucks scenes are when the squad goes into action and the camera work focuses on the wheels and pedals of the bikes. More shots of the Bike Squad riding the streets of their town. The Bike Squad. (2002) Braden Parkes, Graham Spillman, Wolf Bradley, Thomas Garner, Stepahnie Griffen, Michael Louden, Michael McConnohie, Michael Ollifers. Directed by Richard Gabai. Categories: Drama, Coming of Age, Family.